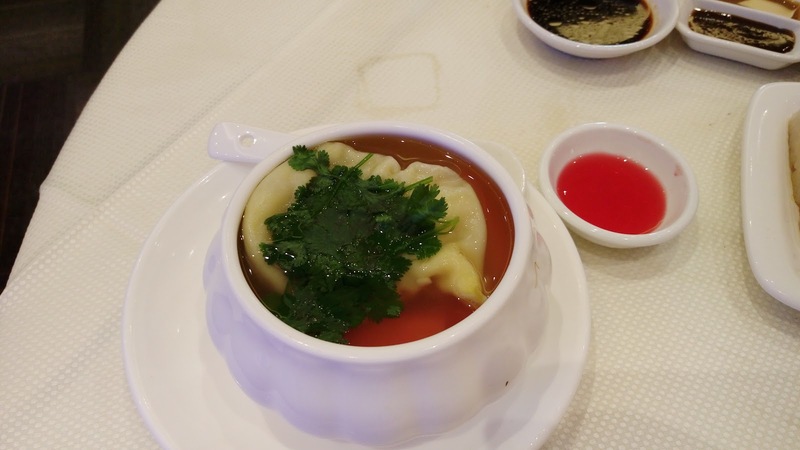 The Steamed Mini Abalone Dumpling in Soup 原汁鮑魚灌湯餃 was one of the chef/kitchen specialty items listed at $9.80CAD each. The "mini abalone" used was Variously Coloured Abalone (Haliotis diversicolor), a type of sea snails commonly known in Taiwan as jiu-kong 九孔 or in Hong Kong as shi-jiu-ming 石決明. The dumpling itself had ample amount of ingredients including shitake mushroom, scallop, ham and etc. The broth was fragrant, but the overly generous amount of cilantro knocked out any detectable savoriness. The mini ormer was overly soft. The Steamed Prawn Dumpling 海洋蝦餃皇 was listed as a large item. 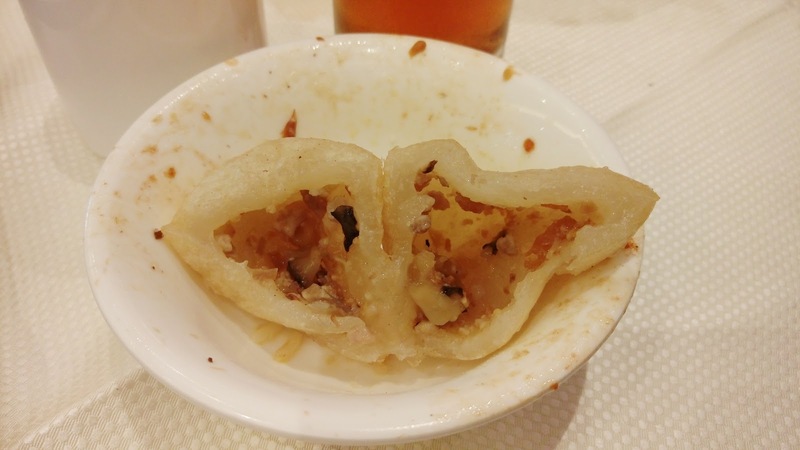 The dumpling wrap was doughy and lacked that translucent consistency. The shrimps had that nice snap crunch but there was a bit too much seasoning in the blend. 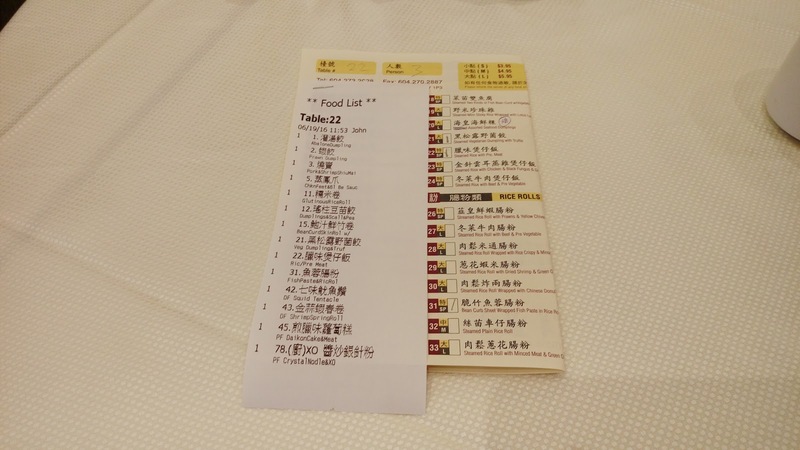 It's a bit odd to see a dim sum menu without normal shiu-mai. Instead of a classic staple, an up-scaled version of Steamed Pork & Shrimp Shiu Mai with Truffle 黑松露燒賣皇 was offered here as a large item. 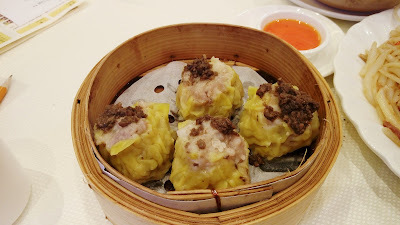 The dumpling itself had a decent ratio between pork fat and grounded meat but shrimp was quite minimal in the mix. The truffle atop, or more properly speaking, a mix of chopped mushrooms blended with truffle oil, didn't do much to enhance the taste. Don't get me wrong, the truffle taste was noticeable, but it did not mingle well with shiu-mai. 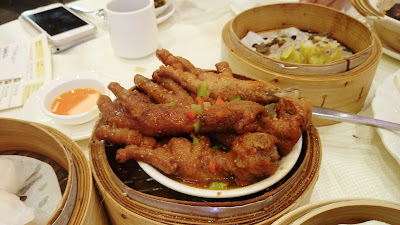 Listed as a large item, the Steamed Chicken Feet with Black Bean Sauce 醬汁蒸鳳爪 was something Buddha Boy ordered, of course, another one of his must-have at any dim sum joints. The claws were soaked in a typical savory sweet sauce but the black bean taste was minimal. Unfortunately, the claws needed to be either deep-fried longer (prior to steaming) or steamed longer because the fundamental fun of easily "slurping" the bones apart was quite far off. Mr. Skipper ordered the Steamed Glutinous Rice Roll Chew Chow Style 潮式糯米卷, but I think he mistakenly ordered this thinking it's the leaf-wrapped glutinous rice 糯米雞. Nonetheless, we all enjoyed this. 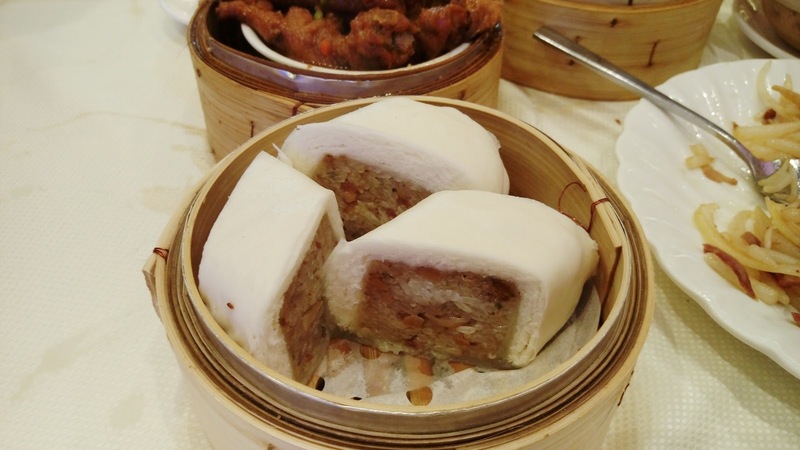 The glutinous rice was first stir-fried with Chinese sausage, shitake mushrooms and peanuts, then wrapped inside a raw dough before being steamed as a whole package. The lightly sweetened bun was fluffy, soft and airy. 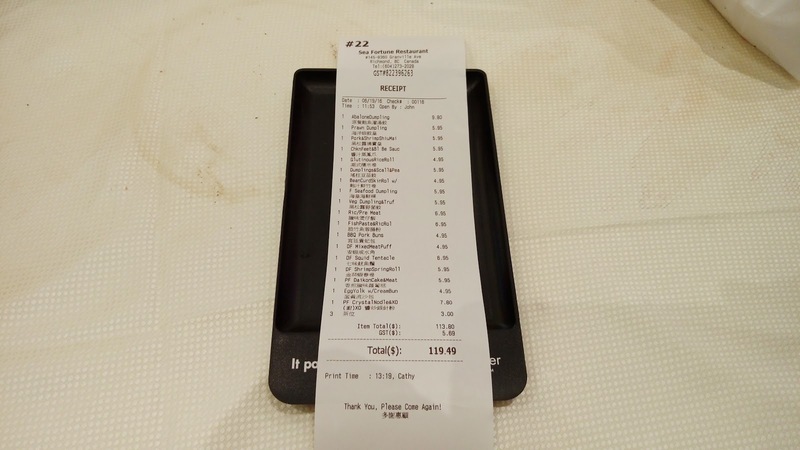 The was a listed as a medium item. 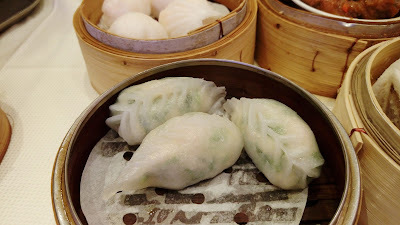 Again, just like har-gow, the Steamed Dumplings with Dried Scallop & Pea Tips 瑤柱豆苗餃 had an overly thick skin wrap that lacked that springy texture. There were ample amount of pea tips and scallops. The vegetables were fine but the scallops were overly fishy. This was listed as a large item. 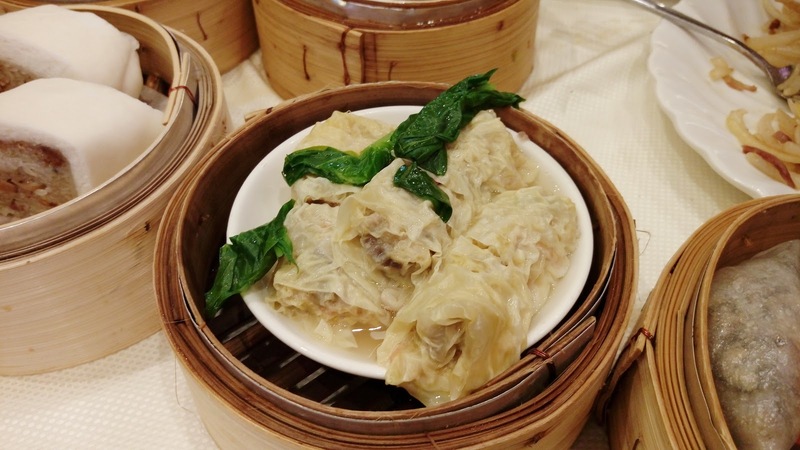 Listed as a medium item, the Steamed Bean Curd Skin Rolls 鮑汁鮮竹卷 was a delicious dish. 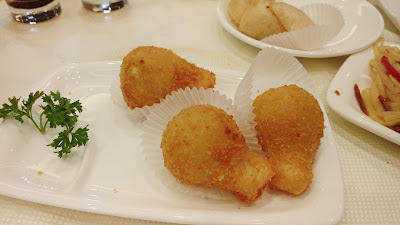 Unlike many restaurants where the rolls would be deep-fried first prior to steaming (mainly because of the low-quality bean-curd sheets they use), their version omits the frying part and places the rolls straight into the steamer before serving. 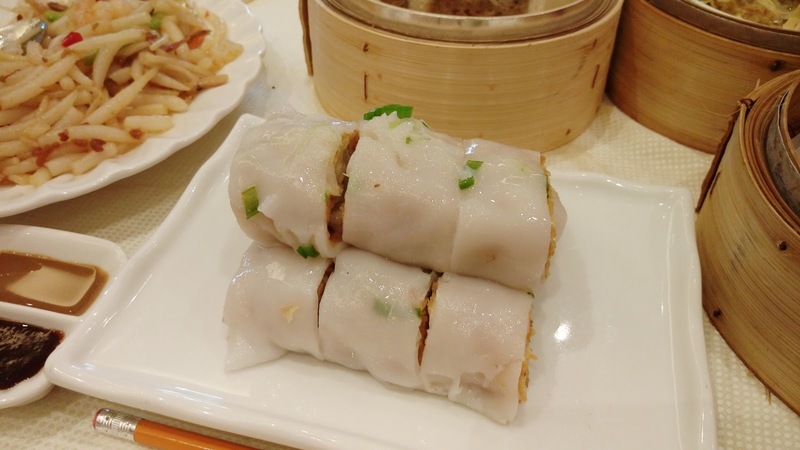 With ample amount of pork filling, these rolls were delicate and less oily to consume. Of course, since the menu seemed to promote truffle, truffle and truffle, why not mimic the award-winning truffle dumplings at The Jade Chinese Seafood Restaurant 玉庭軒海鮮酒家 on Alexandra Road in Richmond? 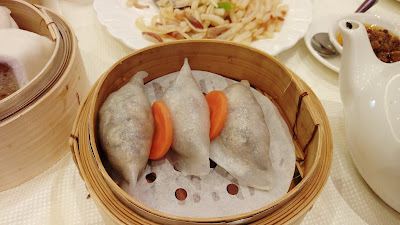 Honestly, the Steamed Vegetarian Dumpling with Truffle 黑松露野菌餃 was enjoyable. While the dumpling wraps were a bit thick and lacked that springy chewiness, the generous stuffing of chopped wild mushrooms made up for the miss. Obvious taste of truffle oil did not bulldoze the earthy tones of wild mushrooms. This was listed as a large item. 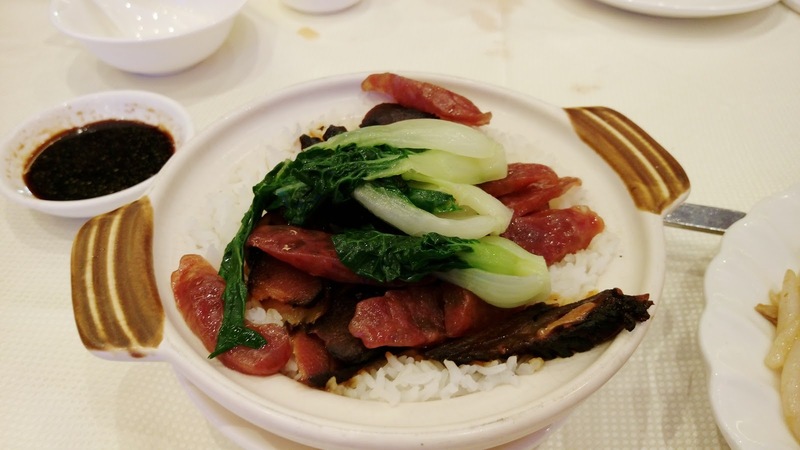 Listed as a special item, Mr. Skipper wanted to try the Steamed Rice with Preserved Meat 臘味煲仔飯. This was not the true style of pot rice where the rice is cooked from raw grains within the pot. Instead, cooked rice was scooped into the pot before placing all the meat and veggie atop. The pot was then sent to the steamer to thoroughly heat all the elements before serving. So for those who love crusty rice on the bottom of any true rice pots, don't expect it here. 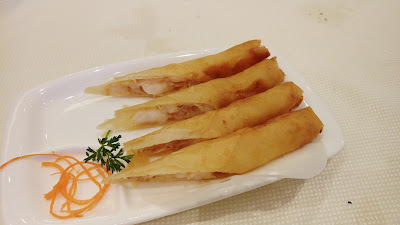 The Bean Curd Sheet Wrapped Fish Paste in Rice Roll 脆竹魚蓉腸粉 had a crispy coat of deep-fried bean curd sheet wrapped with a thin layer of rice roll. The fish paste in the middle had a gentle bouncy texture with hints of cilantro. This was listed as a special item. 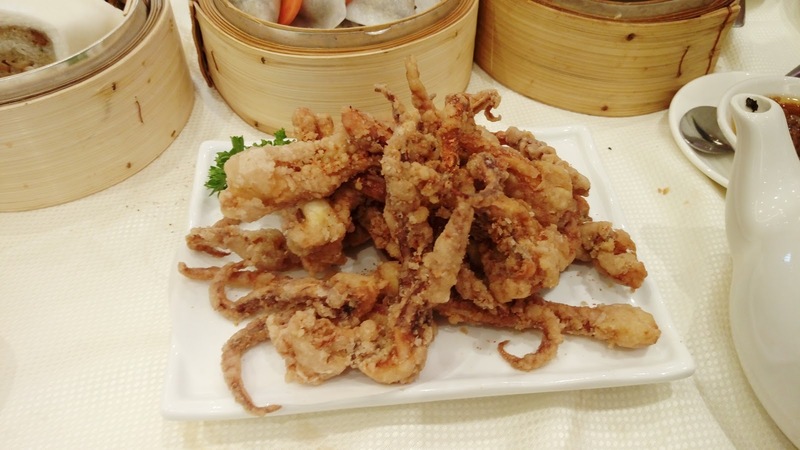 Also listed as a special item, Buddha Boy's order of Deep Fried Squid Tentacle 七味魷魚鬚 was a failure. Not only the squid was fishy, the batter was thick and oily. The oil used was also quite disgusting. Mr. Skipper told us not to eat or buy any squid this year due to the poor supply. Apparently, squid fishing this year was hit quite hard and there's very minimal inventory worldwide. 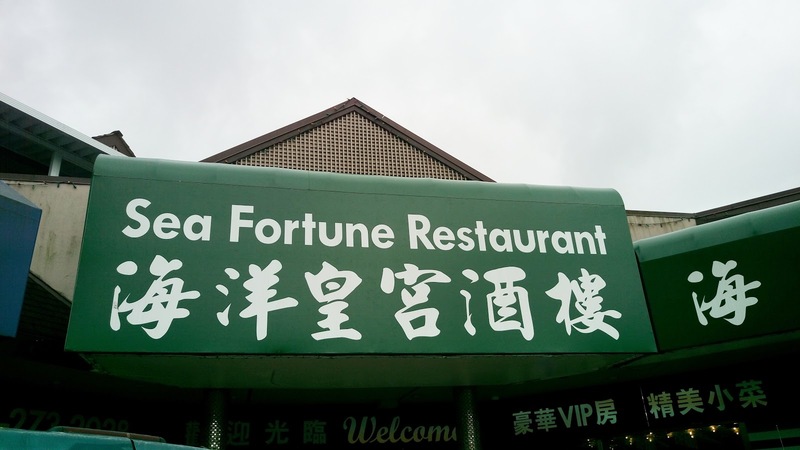 Of course, if it's on the menu, it's on our table. Buddha Boy could not say no to Deep Fried Shrimp Spring Rolls 金蒜蝦春卷. When this was served, the first thought we had was...where's the accompanied dip? Next thought...presentation was weak. 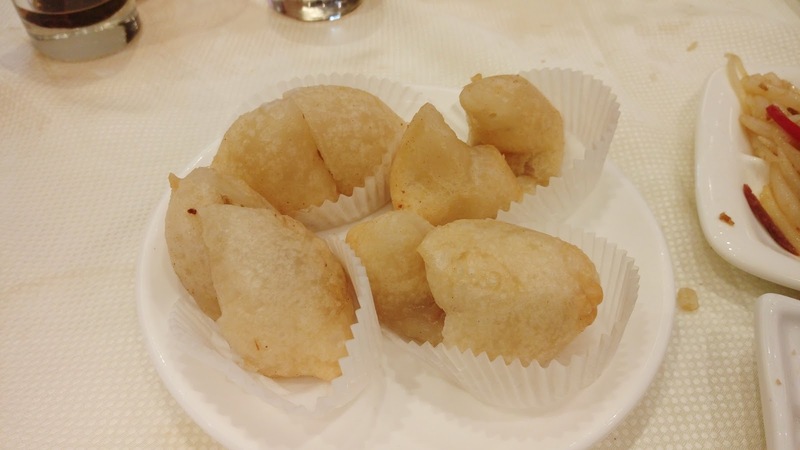 Nonetheless, these rolls were still enjoyable as the shrimp filling was crisp and the outer dough shell was crispy. This was listed as a large item. The Pan Fried Daikon Cake with Preserved Meats 香煎臘味蘿蔔糕, listed as a large item, was something I've been craving for. The cake mix had ample amount of shredded daikon but taste was not considerable. Preserved meats were there but not much in terms of ratio. 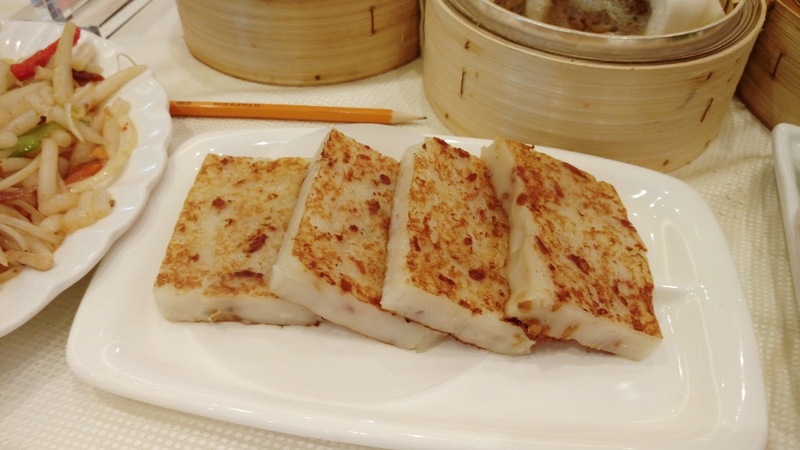 The cakes were pan-fried nicely to obtain that delicate crispy surface. 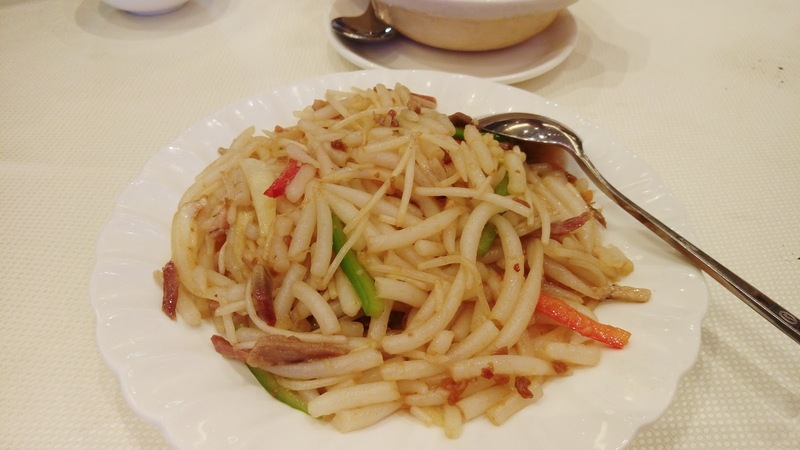 The Pan Fried Crystal Noodle with X.O. Sauce XO醬炒銀針粉 was listed as a chef/kitchen specialty at $7.80CAD/order. This was disappointing. The noodles tasted old, like being kept in the fridge for days. The overall package lacked wok-hei 鑊氣 and XO sauce was minimal in taste. Not recommended. 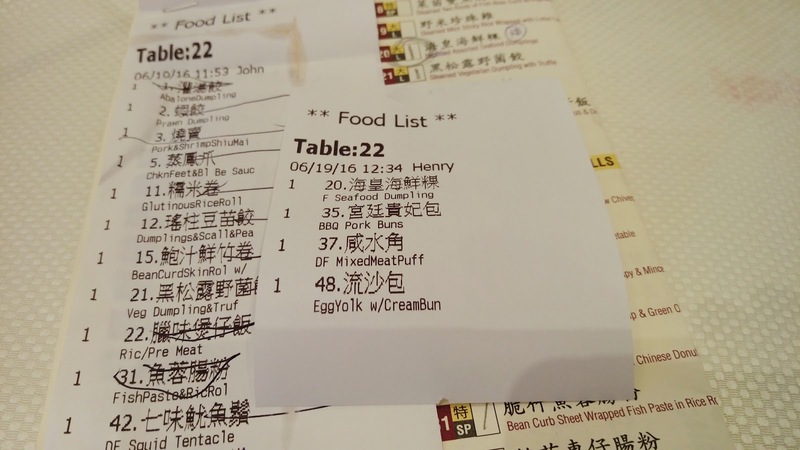 After fourteen dishes, we added four more items. 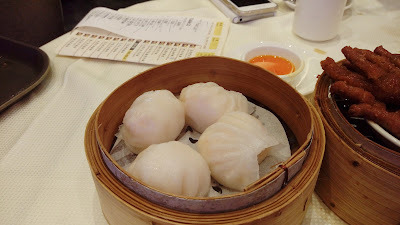 The Assorted Seafood Dumplings 海皇海鮮粿 was listed as a large item. Because the menu item name contains "粿", the three of us assumed that these would be some kind of seafood-stuffed glutinous rice dumplings, or at least some kind of end product made from rice flour...but we were all wrong. There's absolutely nothing "粿" about it. These were simply Japanese-style croquettes, stuffed with low-quality chopped frozen seafood in a mayo-like blend. These were overly sweet and quite messy to eat. 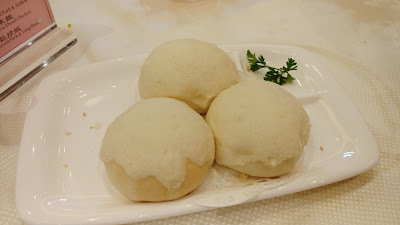 Listed as a medium item, the Baked B.B.O Pork Buns 宮廷貴妃包 was a bit disappointing. The filling was salty, due to the overuse of oyster sauce. The soft bun already used a sweetened dough, so capping it with another layer of sugar made the whole package dreadfully sweet. For dessert, Mr. Skipper wanted the Steamed Egg Yolk w/Cream Bun 蛋黃流沙包, listed as a medium item. 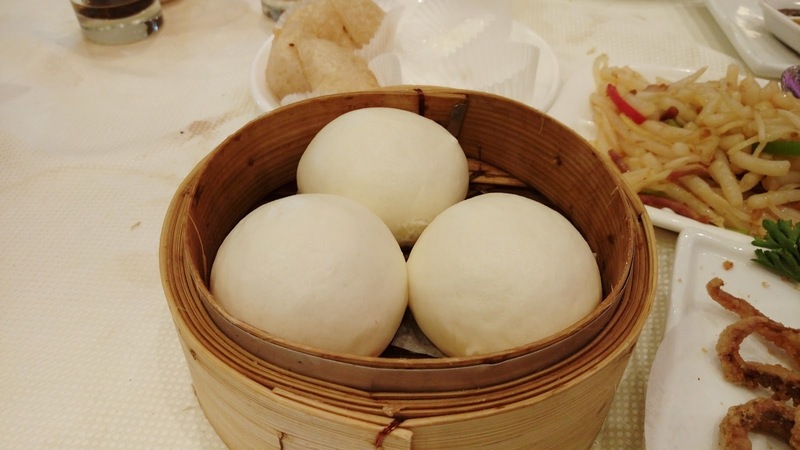 The bun was soft and fluffy, but the savory filling of salty duck egg yolk was not as runny as we expected. Mr. Skipper eats a lot. Buddha Boy eats a lot. Buddha Girl eats a lot. Yup, the three of us ordered eighteen dishes...that's an average of six items per person. Oh boy, no wonder we're fat...LOL! Price points were on the high side, but if you visit during its early-bird 20% off special between 9am to 11am daily with no tea charges, then it's justifiable. Though there were misses, food was acceptable. Service was sparse and the so-called managers were not the most friendly people. Well, of course, we shouldn't expect much service in a Cantonese dim sum joint in Richmond, doesn't matter how fancy or expensive it is.